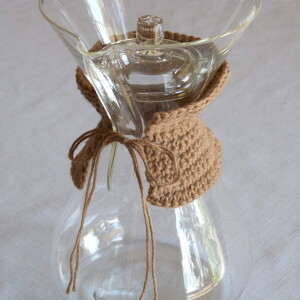 Are you familiar with Chemex coffee makers? Years ago, our coffee maker died and we set out to find something better. We have been making coffee with a Chemex for a few years now and we agree that it is the best way to make coffee. All it takes is a kettle for warming water and Chemex filters and you have coffee in minutes. Because of its simplistic style I was inspired to make an easy cozy with pure cotton yarn. Let me know what you think! (Note: depending upon yarn thickness/fiber, temperature of coffee, quantity in pot, etc, cozy may not prevent you from burning yourself). Row 2 – 8: repeat Rows 2 – 8 of first side. Cut 2 strands of yarn 20 inches long. Attach to middle of piece. Let me know if you run into any problems in the comments below and I’ll help you out! This entry was posted on Saturday, August 29th, 2015 at 12:00 AM by Amy	and is filed under Free Crochet Patterns. You can follow any responses to this entry through the RSS 2.0 feed. You can skip to the end and leave a response. Pinging is currently not allowed. Chemex is awesome and was created in my teeny tiny hometown!! I love this pattern and I will make one for my mom, who has been using Chemexes for as long as I can remember!